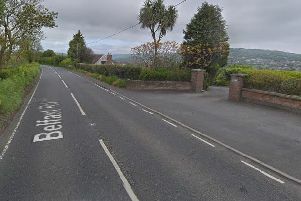 A woman who walked past a bomb disposal robot seconds before a controlled explosion in Londonderry was “shaken but uninjured” police have said. Video footage, which viewers are warned contains strong language, has emerged of the woman leaving Glengalliagh Park via a walkway next to where the security operation was taking place. Moments later a detonation was carried out on a suspicious package. PSNI Inspector Mullan said: “We attended the area following reports of a suspicious object and ATO were tasked. “ We called to a number of homes in Glengalliagh Park and advised residents to leave their homes.